One of the fiercest conflicts in American history was that between the United States Army and the Apache tribes of the American Southwest. Covering vast regions across the American Southwest and northern Mexico, Apache warriors proved not only fearsome in battle against the US Army, but also showed and acumen for military strategy in battle. 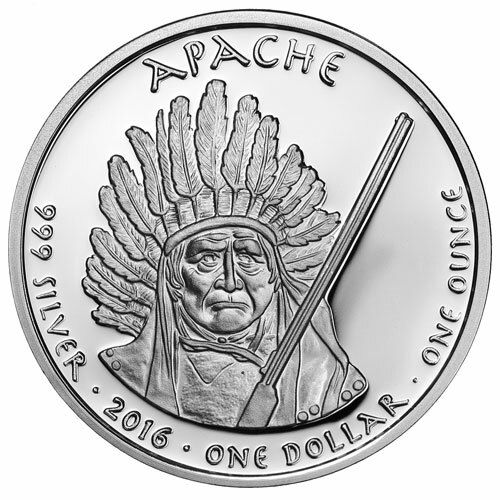 Today, the 2016 1 oz Silver Proof Arizona Apache Rattlesnake Coin is available to purchase on Silver.com. Seventh release in the Native Dollar Series from the Native American Mint! Obverse features the image of an Apache tribal member. Reverse depicts the deadly rattlesnake found throughout the southwest. Apache tribes have lived in the American Southwest for centuries, waging battles for their existence long before the United States was an established nation. Apache tribal nations and warriors fought invading Spanish conquistadors looking to conquer beyond the borders of Central America, fought the Mexican Army after its independence, and waged bloody battles with US Army forces in the 19th century. Today, Apache people number roughly 111,810 across the United States and Mexico. Members of the nation are found in the US states of Arizona (predominantly), New Mexico, Colorado, Texas, Oklahoma, and the Mexican states of Chihuahua, Coahuila, and Tamaulipas. On the obverse of the coin is the image of a member of the Apache nation, along with the engravings of the representative tribe and the coin’s purity, metal content, year of issue, face value, and weight. These 2016 1 oz Silver Proof Arizona Apache Rattlesnake Coins have a satin finish, with a mirror-like appearance. Despite the face value of One Dollar, these coins are not legal tender in the US as only the US Mint has the authority to issue such coins.